Nopal is an ornamental fruiting cactus plant cultivated for it's pads, or nopales. Pads are used like a veggie in Mexican cuisine and have a flavor similar to asparagus and green beans. It is native to the semi-arid areas of the Americas and is now grown abundantly in Mexico, the Mediterranean and in other subtropical regions. Cactus fruit is sweet and juicy and rich in antioxidants, with a beautiful deep red color both inside and out. The flavor can be likened to strawberry and watermelon. Prickly Pear fruit can be peeled and eaten raw or made into syrup, jelly, jam, candy, dried, juiced, or even fermented into beer, wine or kombucha! The fruit is high in amino acids, fiber, B vitamins, magnesium, iron, water, carbohydrates, protein, minerals, vitamin C, and beta carotene. 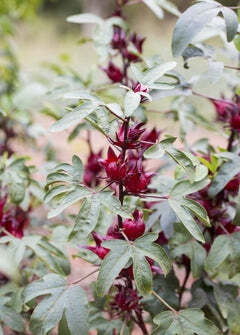 Looking for an attractive, useful and edible plant to line your property with? Look no further because Prickly Pear also makes a beautiful hedge! It can tolerate a wide range of soil types, temperature and moisture levels, however it grows best in sunny, dry, desert-like conditions. On average, Prickly Pear cactus plants will grow to be about 7 ft tall to 7 ft wide. Pads range from 4 to 10 inches and fruit can grow to be about the size of a fist. Soil & Moisture: Dry, sandy, well-draining soil. Prickly Pear Cactus plants thrive in a cactus soil blend or even rough pumice.